Yep..my mom bought the kids a little fish tank..and gave them cash for some fish. I was thinking that we could at least fit 3 fish in this little tank, but the lady at the fish store suggested only one. 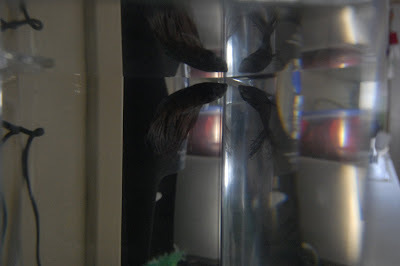 All four kids (well, I guess its more like 3 since Owen doesn't really have a 'say' just yet) had to decided on one fish to share..and then decide to name it. Jessalyn was insisting on "Padme". Luke was insisting on "Joe". Ethan was insisting on "Grievas". 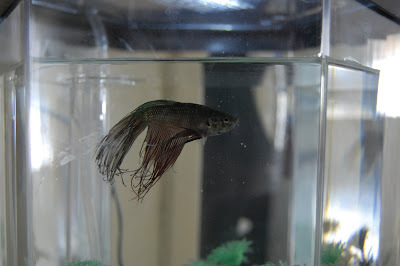 Not one of them would budge..so this fish has been given the full name of "Padme Joe Grievas". So yeah...Betta fish don't like lots of bubbles or current. I had the tank crankin' out the bubbles because I thought it looked cool:) I knew that Betta's will eat each other if they are put in the same tank..so I thought that the fish seeing its reflection was practically torture. 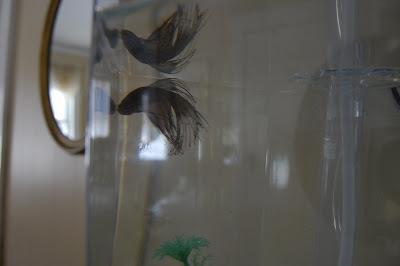 I learned while doing my research that Betta's actually enjoy the company of their reflection and other Betta's as long as they are separated by something so they don't eat each other. I also learned the part about fish needed oxygen from the top of the tank. I must be an idiot because I had no idea about that. When I put the fish in the tank the water from the bag pretty much filled the tank to the top..I didn't think anything of it. So after a few adjustments it seems that the fish is becoming accustomed to its new surroundings. The kids enjoy taking turns feeding him/her (for now) and he lives right on the counter where he gets lots of interaction:) I had no idea that fish had such personalities. He perked right up and came over to the side of the tank when I got out his food this morning to feed him. He also likes to interact with a toy dinosaur that Josh put next to the tank one day. They are buddies. He is either threatened by the camera..or is a natural born model because he was quite interested and doing lots of tricks while I had the camera out. It was kind of funny actually:) He seems to have perked up a bit..although, I've never seen a fish sleep like this little guy does. He hangs out at the bottom of the tank..just chillin'. I'm like a new mother...going over to make sure his little gill's are moving. Luke wakes up in the morning and proclaims "Hey! 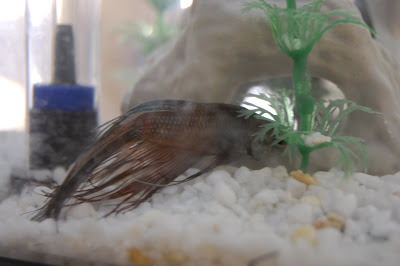 The fish is still alive!". I think all the kids are well aware of what could possibly happen to him..since we are all new to this fish thing. Yes, naming a fish condemns it to death... But at least it's a cool name!